Specifically designed for girls sizes 8-16 and fitting an array of body types, the Uglies’ Lulabelle Girl’s Tankini swimsuit is the perfect recreational swimsuit! 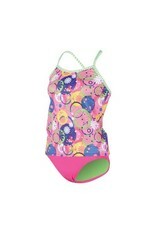 Featuring a fun print and a candy stripe accent, this Uglies tankini is a child favorite! Durability and a closed back are two more reasons this swimsuit is perfect for the water.